The first one is from “The Free Range Cookbook” from Annabel Langbein. She is a New-Zealander cook and her recipes are easy and taste good. Preheat oven to 200C and line an oven tray with baking paper. Place all the ingredients in a large mixing bowl and mix with a big spoon until evenly incorporated. (I use my hands to mix it all). Place the 2 pastry sheets on a work surface. 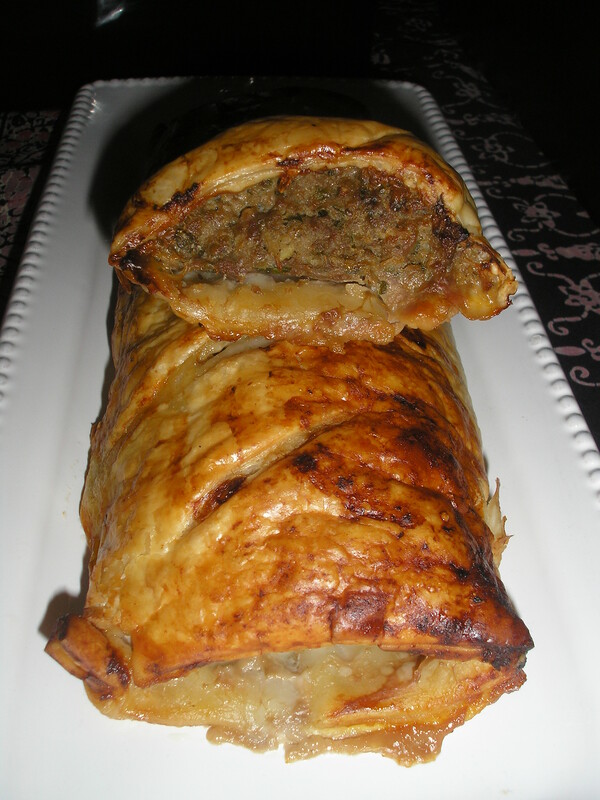 Place half the meat mixture on each pastry sheet, forming a mound the length of the pastry about 6cm in from the edge. Roll up the pastry to fully enclose the filling. Cut each roll into 3 slices (or up to 6 slices if you want small sausage rolls or like I did, 2 giant sausage rolls). Place on the lined baking tray seam side down. Use a sharp knife to slash a few lines across the top of each sausage rolls to allow the steam to escape. Make a glaze by mixing the egg yolk and 1 tbsp of water. Brush over the pastry. Bake for 30-35 minutes until golden brown. (It took longer in my oven, about 50 minutes). The meat mix is quite sloppy, so squeeze out as much liquid as you can out of the grated apple and onion. You could probably add some breadcrumbs as well. When the sausage rolls are cooking, there is quite a lot of liquid coming out of them. Annabel recommends soaking the juices with a paper towel so the pastry remains crisp. You could also put the rolls on a cooling rack above the oven tray and bake them like this (juice dripping into the tray). Best eaten on the same day. But nice the next day reheated or cold. Freezable. Serve with a nice green salad and some tomato sauce or chutney. The other recipe comes from “The Meat free Monday Cookbook”. Put the cumin and coriander seeds in a small frying pan and toast over medium heat until fragrant. Lightly grind using a mortar and pestle. Soak the saffron in 1 tbpn of boiling water. Heat the olive oil in a big sauté pan or casserole dish over medium heat. Add the onion and cook for 3-4 minutes until softened but not coloured. Add the ground spices, garlic, ginger, cinnamon, saffron and as much harissa as you like. Cook for 1 minute, stirring. Add the vegetables, the tomatoes and chickpeas, stir to coat. Add the vegetable stock. 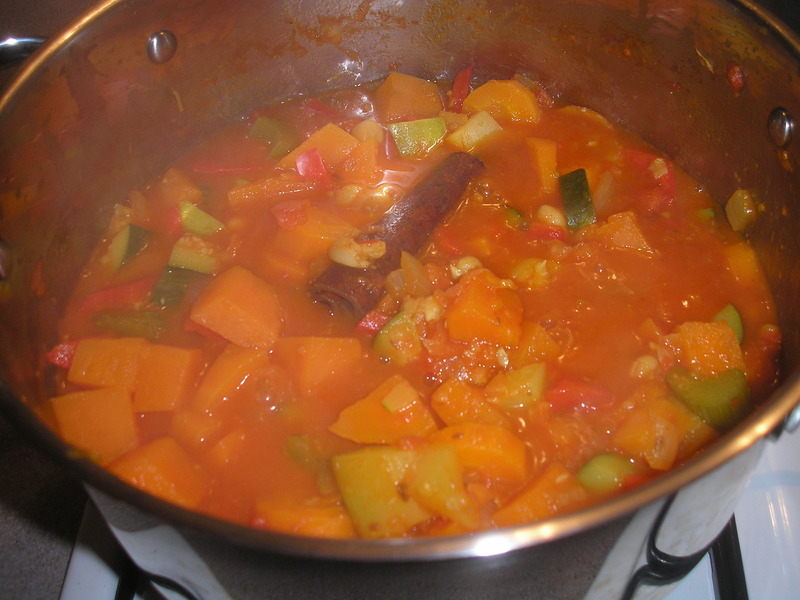 Bring to the boil, reduce the heat to a simmer and cook for a further 20-25 minutes until all the vegetables are tender. You can freeze it. Eat hot with couscous, preserved lemons and a dash of honey (if you like honey). Or eat it cold like I did, with some rice, preserved lime and labne. Mondays: the week starts again and sometimes it’s hard! PAY ATTENTION TO ALL FIVE FOOD GROUPS: FRUIT, SAUSAGE ROLLS, POPCORN, CUSTARD TARTS AND LUNCH. BEGIN EACH DAY WITH THREE LONG BLACKS, A COKE AND A PACKET OF PETER STUYVESANT. My new year resolution 2014 is to cook one recipe (at least) from one of the numerous cookbooks I have every week. So, here is the start! This is actually a recipe from Sophie Zalokar heard on ABC radio Perth. Mix the grated and sliced zucchini, onion mixture, rice, eggs, feta, dill and 1/4cup of the pinenuts in a big bowl until combined (it is quite a moist mixture but the rice will absorbe it all while it’s cooking). Add salt and pepper and spoon into the prepared pie dish. Smooth the top over. Sprinkle over the mozzarella and the remaining pinenuts. I find that it needs more seasoning, so next time I will add more feta and maybe a bit of chilli in it. I did freeze some of it for another day.